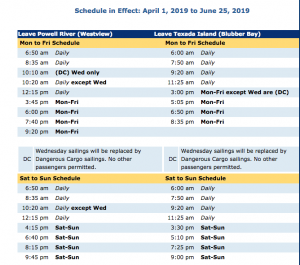 POWELL RIVER, BC- On April 1st there will be some schedule changes for the ferry between Powell River and Texada Island. Currently, a ferry leaves Powell River at 10:40am Monday-Friday except Wednesdays. Starting on April 1st, there will be no ferry at that time. Instead, there will be a ferry leaving at 10:20am daily except Wednesday. Currently a ferry leaves Powell River at 9:35am Saturday-Sunday. Starting on April 1st there will be no ferry at that time. Instead there will be a ferry leaving at 8:30am Saturday-Sunday. Currently a ferry leaves Texada Island 8:45am Saturday-Sunday. Starting on April 1st there will be no ferry at that time. Instead there will be a ferry leaving 7:50am. There will be an additional ferry leaving Texada Island at 9:20am Saturday-Sunday. The new schedule will be in effect from April 1st- March 31st, 2020.